How to start with MeetingRoomApp Mini? It’s simple. How to book a meeting room and how to send a calendar invite in Google Calendar. How to book a meeting room and how to send a calendar invite in the Outlook email client. The steps for integration with your Microsoft Office365. The steps for integration with your Microsoft Exchange 2007, 2010 and above. 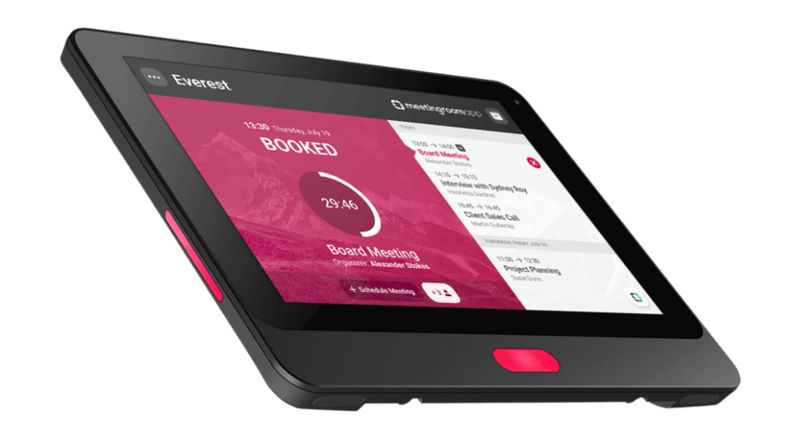 This FAQ describes how to install a application MeetingRoomApp on the 2N® Indoor Touch unit and pair it with the Microsoft Exchange calendar account. The steps for integration with your G Suite (Google Apps for Work). You’ll find two hidden gestures which you need to shut down from the kiosk mode. We support the new Single App Mode function for iPads. Screen Pinning helps your Android Device lock to MeetingRoomApp. This feature is available only for devices with Android 5.0 and above. Guided Access helps your iPad lock to MeetingRoomApp. Technical documentation for easy integration with your Microsoft Office365 in the Cloud. Technical documentation for easy integration with your G Suite in the Cloud. Technical documentation for easy integration with your Microsoft Exchange in the Cloud. All the important information in one place. In a few simple steps, this manual will introduce the basic functions of the app and teach you how to use it effectively. MeetingRoomApp is a meeting and conference room booking system. 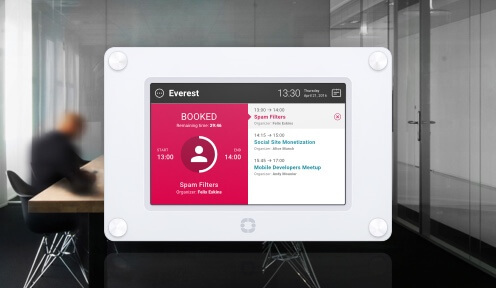 Installed on tablets or other hardware devices at meeting rooms, it provides a comprehensive, advanced booking system with a number of smart functions. Available as Mini, Cloud or On-Premise product variations. What’s the difference between Mini, Cloud and On-Premise product variations? The main difference lies in device configuration and functionality. The Mini variation cannot be configured remotely and the server address and calendar need to be set up directly on the device. For this reason, the Mini solution is ideal for offices with up to 5 meeting rooms. Unlike Mini, the Cloud variation offers an intuitive advanced web interface which allows for remote device administration and other functions. If your security policy doesn’t support cloud applications, the On-Premise variation will make sure the MeetingRoomApp server is installed directly on your virtual servers in your infrastructure (Debian, Ubuntu, RedHat, Windows). Where can I make a reservation from? 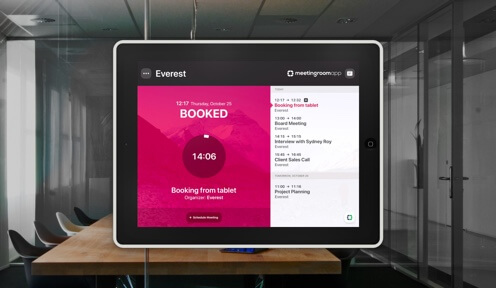 You can book your meetings directly on the meeting room device, from your desktop computer or a mobile device. What email clients can I synchronize MeetingRoomApp with? The system can be synchronized with G Suite (Google Apps for Work), Microsoft Exchange or Office365. 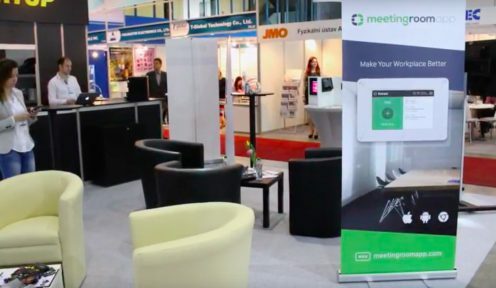 What platforms does MeetingRoomApp work on? MeetingRoomApp runs on Android, iOS and Digital Signage Web browsers which can display the application on smart televisions. Can I download the app and try it for free? You can download a 10-day trial MeetingRoomApp Mini from Google Play or a 10-day trial MeetingRoomApp Cloud from App Store or Google Play or Sign up here. How do I install and connect the app? We have prepared a series of articles to help you install your app. Please check out our Help centre for manuals and interactive videos. How can I pay for MeetingRoomApp? You can purchase a licenses, subscriptions in our Shop and pay by PayPal or pay by credit card.